A while back, being the bad blogger that I am, Brad obtained a new toliet for one of our bathrooms. We were unsure of whether or not to put it in the upstairs bathroom or the downstairs bathroom. And for some reason or another while we Brad was deciding if the upstairs toliet could be fixed or needed to be replaced, the new toliet ended up in our living room. 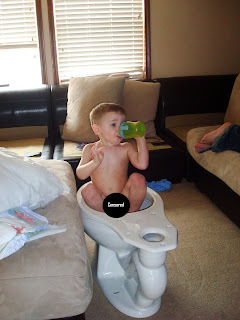 Preston apparently felt the need to make good use of this toliet by claiming it as his royal throne while he watched cartoons. Which is why the toliet ended up hanging around our living room for a few days. Even after we Brad decided that it would be going in the downstairs bathroom. We think Preston might be ready for potty training. You know if I could hook up a toliet in my living room.